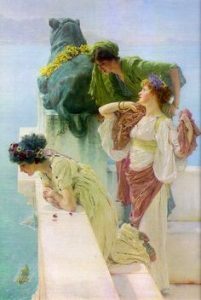 Below is the detailed biography of Sir Lawrence Alma – Tadema, a Dutch painter from the Netherlands holding a special British Denizenship. 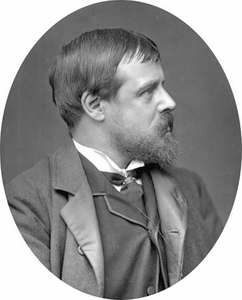 He was great at capturing in his paintings the elements of luxury living in the Victorian Era. He was a classical subject painter. 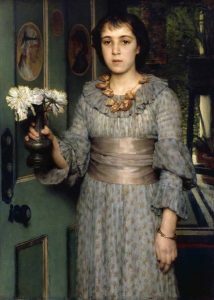 Lawrence Alma – Tadema was born in Dronjrip, the Netherlands in the Northern area of the Netherlands. 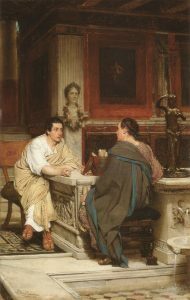 His father was Pieter Jiltes Tadema who was a notary and 3 children from a previous marriage and 3 out of the second amongst whose, the third child was Lawrence. Pieter was the village notary. His mother’s name was Hinke Dirks Brouwer. Lawrence had a real sister who he loved dearly. Lawrence’s father died when Lawrence was only 4, leaving his mother to take care of the three boys from the previous marriage, Lawrence and Lawrence’s sister. She had inclined towards art herself and therefore believed her children must have artistic qualities. Therefore, she sent Lawrence to a local drawing master which was where he received his first training in art. In 1851, he suffered a mental and physical breakdown which was diagnosed to be serious and was proclaimed to live for only for the next few years. He was intended to be a lawyer but since he had only a few days in hand, he was given the liberty to enjoy painting and drawing. Soon, he recovered and enhanced the passion that led him to be a painter. In the year 1852, he moved to Belgium to study art and joined the Royal Academy of Antwerp where he studied as a student for four years. There he was awarded for his brilliant work many times. At the Academy, he was very influenced by his master Louis (Lodewijk) Jan de Taeye. Hence, after leaving the Academy he apprenticed under him for about three years and worked at his studio learning and exploring the basics of art. His master Louis introduced to various tribes of the Merovingian which later became his subject of interest for portrayal. He later apprenticed under Baron Jan August Hendrik Leys, a famous painter at Belgium whose studio was very renowned across Belgium. 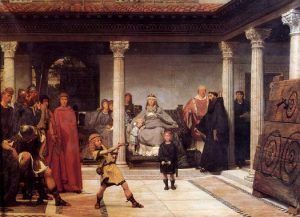 Under his guidance and support, he exhibited his first huge painting ‘The Education of the children of Clovis’ in the year 1861. ‘The Education of the children of Clovis’ was purchased by a collector and gifted to King Leopold of Belgium. For a long time, his theme remained the Merovingian subjects, that is until the mid 60’s. He switched his theme to ancient Egyptian subjects soon after he realised that the Merovingian subjects weren’t providing him with international recognition. He went to honeymoon with his wife to Italy which was his first time and later travelled to Rome, Naples and Pompeii. Here, he became influenced by Greek and Roman characteristics of Art. His paintings were then seen by Ernest Gambart when he was painting ‘Egyptian chess players’ in 1864. Much impressed by the works of the young artist, Ernest gave him 24 more orders and even arranged to exhibit three of his artworks at London. Here he was sent to London and given the honourable title of ‘Knight’ in the ‘Order of Leopold’. 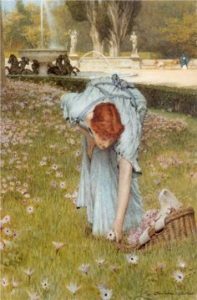 After this, he was known as Sir Lawrence Alma – Tadema. He moved to London in 1870 with his family that consisted of his sister and his daughters. By 1871, he was a famous and highly paid artist in London. He also painted with the preraphaelite group in 1872. 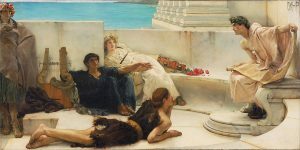 Lawrence Alma – Tadema was a sensitive man that took critics very seriously. He had the tendency to be anxious very soon and that led to him being depressed. He lost his mother in the year 1863 and that made was a major factor that led to his depression and trauma in the same year. He married a woman named ‘Marie-Pauline Gressin Dumoulin’. She was the daughter of Eugène Gressin Dumoulin, who was a French journalist that lived near Brussels. She is seen in some of his paintings. They had three children – a boy and two girls. The boy was the elder one who died of smallpox as a child. The girls were Laurence and Anna, both having inclination towards art. Laurence grew up to be a novelist and a poet and Anna was a painter much like her father. His wife died at the early age of 32, in the year 1869. This again led to Lawrence being depressed for a long period of time. During this time, he didn’t paint for nearly four months. His sister then moved in with the family and took responsibility of the girls until she got married in the year 1873. After he moved to London with his family he started giving painting lessons to Laura Epps who the daughter of Dr Epps. He fell in love with her and proposed her but Dr Epps opposed the marriage as Laura was only 17. They married in the year 1871. Laura became a renowned painter and her genre domestic paintings of women and children. 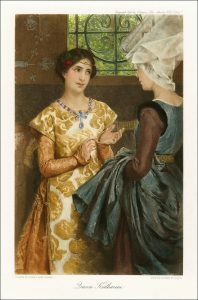 She readily became the stepmother to Laurence and Anna, the girls of Lawrence and Marie – Pauline. 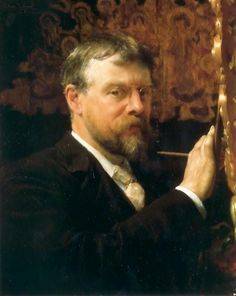 Sir Lawrence Alma – Tadema continued to exhibit his paintings until the 80’s and was still receiving fame and recognition. In the year, 1883 he moved to his house which he decorated for many years. He was elected as the honorary member of Oxford University Dramatic Society in 1890. He also received a medal of honour in the previous year at Paris Exposition Universelle. He earned the Grand Prix Diploma in the same phase which is a great achievement in Europe. He was also given the title of ‘Knight’ in London which is rarely given to artists. Lawrence Alma – Tadema was diagnosed with an ulcer in his stomach. In the year 1912, he went to Wiesbaden, Germany for his treatment along with his daughter Anna. There, he died on the 28th of June. He was buried at the St Paul’s Cathedral, London.